You’re in deep with credit cards, student loan debt and car loans. Minimum monthly payments aren’t doing the trick to help nix your debt. 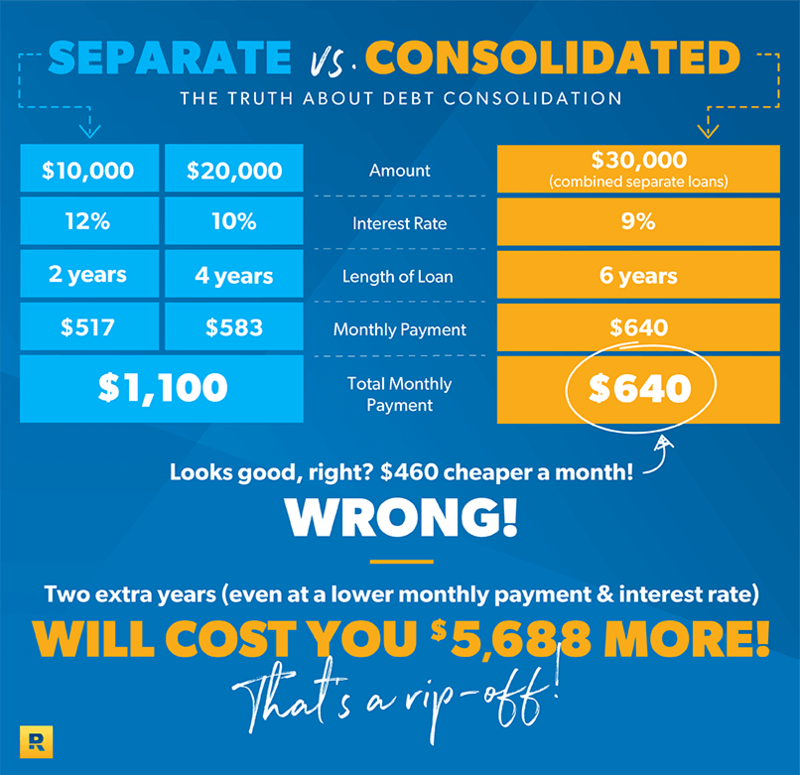 Something has to change, and you’re considering debt consolidation because of the allure of one easy payment and the promise of lower interest rates. 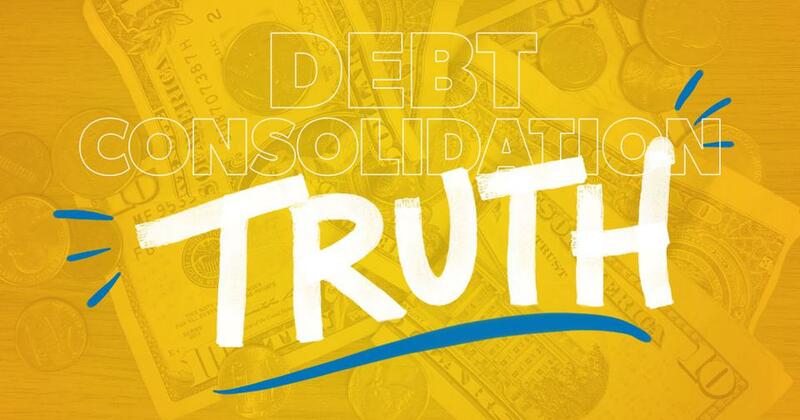 The truth is debt consolidation loans and debt settlement companies don’t help you slay mammoth amounts of debt. In fact, you end up paying more and staying in debt longer because of so-called consolidation. Get the facts before you consolidate or work with a settlement company. Debt consolidation is a refinanced loan with extended repayment terms. Extended repayment terms mean you’ll be in debt longer. A lower interest rate isn’t always a guarantee when you consolidate. Debt consolidation doesn’t mean debt elimination. Debt consolidation is different from debt settlement. Both can scam you out of thousands of dollars. When you consolidate, there’s no guarantee your interest rate will be lower. Lower interest rates on debt consolidation loans can change. This specifically applies to consolidating debt through credit card balance transfers. The enticingly low interest rate is usually an introductory promotion and applies for a certain period of time only. The rate will go up over time. Consolidating your bills means you’ll be in debt longer. In almost every case, you’ll have lower payments because the term of your loan is prolonged. Extended terms mean extended payments. Your goal should be to get out of debt as fast as you can! Your behavior with money doesn’t change. Most of the time, after someone consolidates their debt, the debt grows back. Why? They don’t have a game plan to pay cash and spend less. In other words, they haven’t established good money habits for staying out of debt and building wealth. 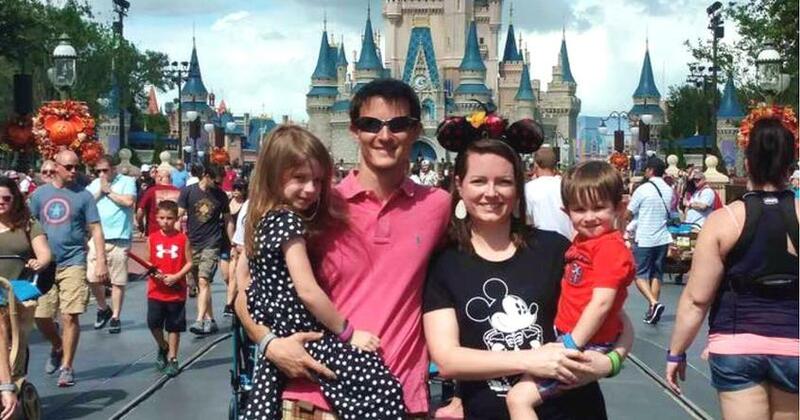 Their behavior hasn’t changed, so it’s extremely likely they will go right back into debt. But here’s the downside: It will now take you six years to pay off the loan. Six. Years. If that’s not bad enough, you’ll end up shelling out $46,080 to pay off the new loan versus $40,392 for the original loans—even with the lower interest rate of 9%. This means your "lower payment" has cost $5,688 more. Two words for you: Rip. Off. There’s a huge difference between debt consolidation and debt settlement, although often the terms are used interchangeably. Debt settlement is a scam, and any debt relief company that charges you before they actually settle or reduce your debt is in violation of the Federal Trade Commission. (3) Avoid debt settlement companies at all costs. Pay off debt. Save more money. Get started reaching your money goals with our free 4-Day Jump Start. The solution isn’t a quick fix, and it won’t come in the form of a better interest rate, another loan, or debt settlement. The solution requires you to roll up your sleeves, make a plan for your money, and take action! What’s the reward for your hard work? Becoming debt-free! Take control of your money with our step-by-step plan, Financial Peace University. Get started today! In short, debt management companies are out. Hard work is in. Change your financial behavior and change your life...for good. True debt management is about one thing – you controlling your money.